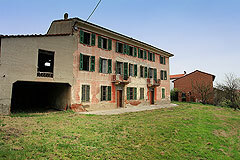 Country Estate for sale in Piemonte. Acqui Terme Near Acqui Terme, Alessandria region (ref: 6783)- PRICE REDUCTION -A really wonderful old historic home requiring restoration and situated close to a famous and historic town.. Piedmont Properties in Piemonte. Property for sale Langhe and Piemonte. Map for Property ref: 6783, Country Estate for sale in Piemonte. - PRICE REDUCTION -A really wonderful old historic home requiring restoration and situated close to a famous and historic town.